The term “innovation” is thrown around a lot in our industry, and while it may seem to lose its value after prolonged overuse, we think it still has a strong place in our product development strategy in describing our commitment to driving our business partners and the industry forward. The most meaningful place for this term is in our in-house product conception group, the Innovation team. As a team, we hold weekly meetings to drive strategy and collaboration to deliver trend-oriented, forward thinking natural skincare concepts to our customers. The Innovation team is driven by our Director of Innovation, and its board includes the VP of Sales, Director of Trend and Marketing Strategy, Engineering and Maintenance Director, Director of Formulation, and Product Engineer. 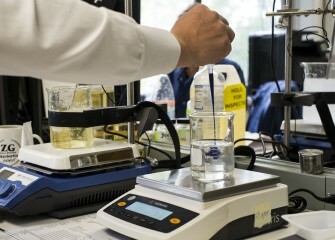 On a quarterly cycle, this team, with our R&D Formulators, decides which products to present to current and prospective customers as a way to showcase our capabilities and harness new technologies, such as our glow-in-the-dark bar, soap-free facial cleanser, and lotion cleanser or trends, such as pet skincare or seasonal ingredients and trends. The work of this group is brought on to the road and helps to guide product concept discussions with each of our business partners. At the start of each development cycle, this group comes together to determine new product concepts, regulatory and naturalness guidelines, product benchmarks, and available packaging concepts. With this information, the Formulators take to their benches to develop concepts that either achieve or surpass each of these expectations. Products that come out of Innovation Engineering are formulated with our four pillars in mind: they are free of parabens, PEGs, sulfates and silicones. They are usually inspired by unique textures and concepts from less natural markets, such as South Korea, and we strive to elevate natural product standards to inspire and delight customers. We often feature our quarterly launches on our blog, and if you have any questions about any of these new developments, we encourage you to reach out to a member of our Sales team to have a discussion about new product development with Twincraft.